Turned the bikes in on Thursday and wanted to wrap up with a few pictures. I still have to go through my GoPro video and do some editing. After that I will probably post it on YouTube and put some links here. It all went too fast and Jane was even a little sentimental turning her bike in. The 650 GS's were more than adequate for the trip. Other than one burnt out headlight, fixed by a quick stop at a NAPA store, they worked great. All the planning paid off as we had no major glitches on the trip. Met people from all over the world including Denmark, Holland, New Zealand, Australia, Germany, Spain, Argentina, and the UK. Probably the strangest thing happened in McCarthy which is in the middle of nowhere 60 miles form the nearest paved road. Jane and I went into an art gallery and heard people talking about DeWitt and Davenport. It turned out the owner of the shop was from Humbolt and the three other patrons were from Dixon, so all 6 of us were from Iowa. A few more memorable shots. Click on the photos to view in a larger format. Jane on the Denali Hwy. Jane and I on the return air taxi flight to Chitina. 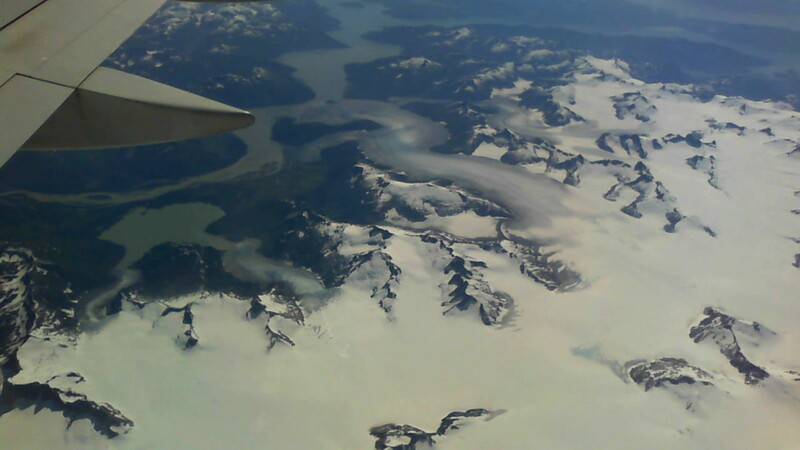 Ice fields and glaciers over Canada on the way home. 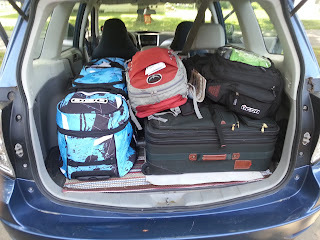 How did we get all of this plus a camera bag on 2 motorcycles? This is our last update from the road as we turned in the bikes yesterday. We are waiting to get picked up by the shuttle to head to the airport in Anchorage. All the planning paid off as the trip went very smoothly. The accommodations were better than I expected. The food was great (I've never ate this much fish cooked so many different ways). The views were unbelievable. After the first couple of days we were asking ourselves what else do we need to see, then we would experience a different area or experience that was totally unique. Alaska is a must see in your lifetime Jane and I are already talking about another trip to see more. Enough of my ramblings here are a few more pictures. Finally got WiFi again. Day 9 completed. Going to view another glacier this morning before dropping off the bikes later today. Amazing trip, this is a must see in your lifetime. Jane and want to do this again in a couple of years.